Illustration: Catherine Song. © The Spruce, 2019. Getting chicken safely from a rock-hard frozen state to a thawed ready-to-cook state raises a lot of questions. The method you use is important for safety, convenience, and getting a better result in your cooked chicken. You will also use different methods depending on whether you are thawing a whole bird or smaller cuts. First, the chicken should never be thawed on the counter at room temperature or in a bowl of hot water. 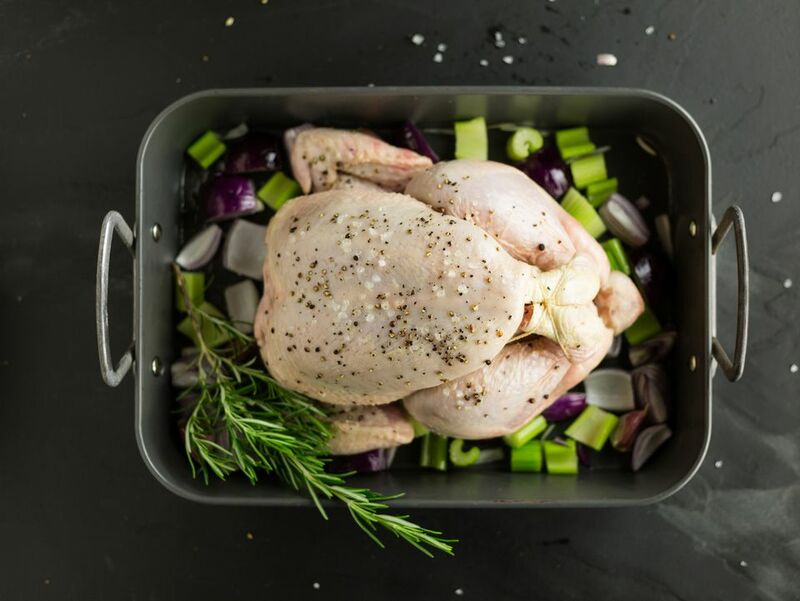 The following methods should allow you to thaw chicken and keep it out of the “danger zone” (40 to 140 F), which is the temperature zone that allows bacteria to grow. In general, larger cuts of chicken, especially a whole chicken, should be thawed in the refrigerator. 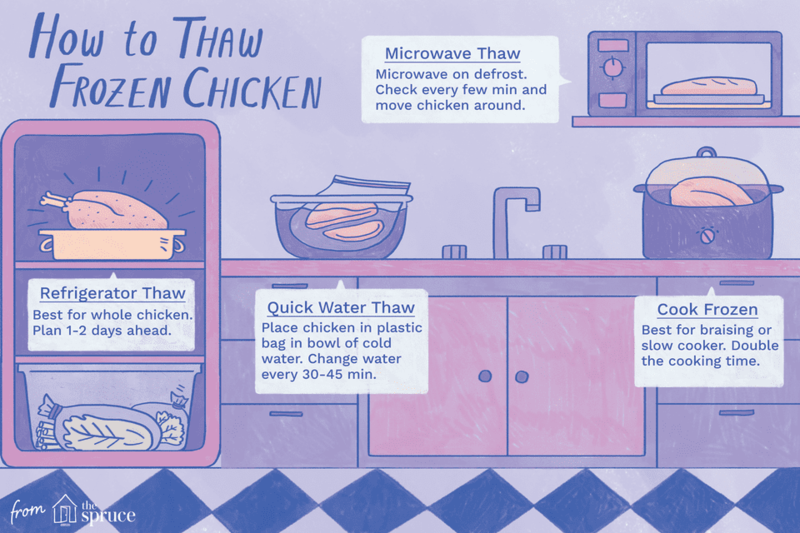 A microwave thawing method isn't good as the chicken will start to cook on the outside. Using a thawing method in a bowl of water will take a very long time for a whole bird or large cut. However, smaller cuts (especially boneless cuts) do well with the cold bowl of water or microwave methods. Refrigerator thawing most reliable and safe method, and also the one that requires no hands-on attention. But you need to plan ahead, especially if you are thawing a whole bird or a large amount of bone-in pieces in a single package. Even a pound of ground chicken or a couple of pounds of chicken breasts will probably take up to a day to fully thaw in the fridge, and a five-pound bird might take two days. You can leave chicken thawed in this way for another day or two in the fridge before cooking. Frozen chicken can be placed tightly sealed (either in vacuum sealed bags or sturdy, leak-proof, zipper-top storage bags) in a bowl of cold water. Do not use hot water. Besides possibly enabling bacteria to multiply, warm water will also start to “cook” the outside of the meat before the middle is thawed. If your cold tap water is relatively warm, as is common in the summer in some areas, add ice cubes to the water to bring the temperature down to where it feels pleasantly cool. Change the cold water every 30 to 45 minutes to make sure the water stays cold. Ground meat might thaw in an hour, a small amount of boneless chicken will probably thaw in one to two hours, and larger amounts and bigger cuts may take a few hours. If you are thawing multiple pieces in a bag, once the pieces have thawed enough to be separated, open the bag, pull the pieces apart, then reseal the bag and return it to the water. Keep checking until the meat is thawed. Once the meat is thawed using this method it should be cooked right away. Some microwaves have settings that allow you to thaw chicken (and many other ingredients) by simply pressing a button. Read your instruction manual to see if your microwave has this kind of capability, and note special directions having to do with the amount of chicken and the type of cut. If you don't have a programmed chicken thawing setting on your microwave, you can thaw your chicken in this way but it will require some attention on your part. Set the microwave to defrost, and check every few minutes to see when it is thawed properly. Move the chicken around in the microwave, especially if you don’t have a rotating tray. Even if you are vigilant, often the thinner parts of the chicken will start to cook a bit while the thicker parts are still thawing, so it’s not the ideal method for thawing. Meat thawed in the microwave should be cooked right away. You can cook chicken in its frozen state. The general rule of thumb is to add another 50 percent of cooking time to the time suggested in the recipe. For example, if a soup recipe calls for cooking it for 60 minutes, plan to cook it for 90 minutes. Certain cooking methods lend themselves better to using unthawed chicken, such as braising, slow cooker, or using the chicken in soups and stews. Other methods (like sautéing, roasting, or microwaving) may yield slightly uneven results, with the outside of the chicken cooked more than the inside or a less-than-ideal texture. For instance, you won’t be able to get a nice caramelized exterior on a piece of frozen chicken if you sauté it, as the moisture in the chicken will be slowly released as it defrosts in the pan, preventing browning. If you use frozen chicken in the slow cooker, it is safer to set it to the high setting to bring the temperature up faster so your dish is not in the temperature danger zone as long. Is It Safe to Refreeze Turkey?